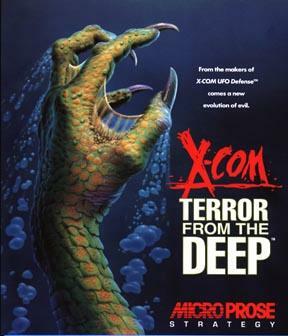 Terror from the Deep is the game that ignited my love for turn based strategy games. I first played it on the PS1 way back when, and spent about 6 months playing it despite the clunky PS1 controls. I sucked at it of course, and despite a lot of trying, I didn’t get very far. Now, after day-jobbing UFO: Enemy Unknown, I thought it was time to step up and cross TftD off my list. Set in 2040, after you destroy Cydonia in the first X-Com a signal is sent to earth that awakens an ancient race that have lay dormant for millions of years. The X-COM agency is resurrected by the governments of Earth, and you set out on your merry way being face-fucked by the alien bullets. You can’t use the same weapons from the first game because they don’t work underwater, and there are limited supplies of Elerium-115 left. It is a little convenient, but it does make sense. It’s a sequel, so what are the differences? Urrrm, on the surface not much as it is all appears to be cosmetic. Instead of being on land, your battles are (primarily) underwater. The aliens, and the guns have different names, though they mostly do the same thing. Sectoids are now Aquatoids, Guass Weapons replace Plasma, Disruptor Pulse Launcher replaces the Blaster Launcher. 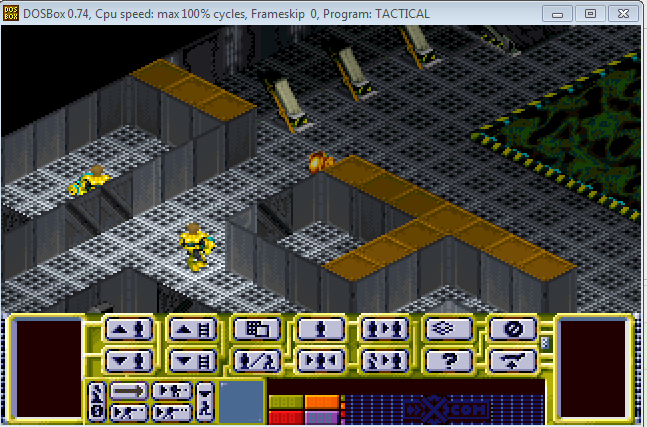 I won’t list everything, but if you played the first X-COM, you’ll immediately know what you’re doing here. Otherwise some of the names are less intuitive than the first game, so may require a little more time doing some further reading. 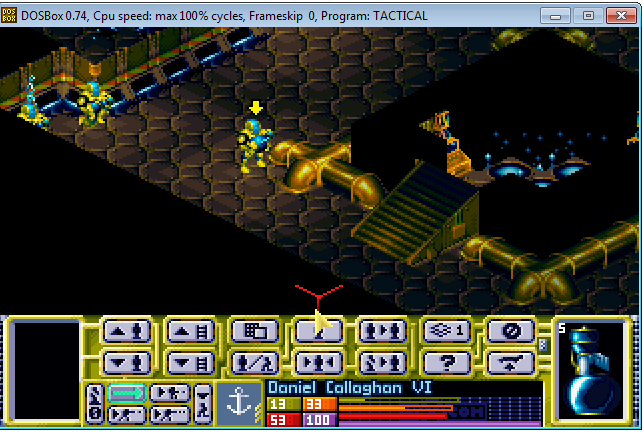 The first X-Com’s difficulty curve started very high, and after around a third of the game it became too easy. TftD isn’t as difficult at the start, but the difficulty really ramps up once the Lobstermen arrive. Whenever I thought TftD was starting to get too easy, a new alien or mission type would appear that would take me out my comfort zone, and make me adapt. It means that last half of the game feels fresher, and doesn’t drag as much. Terror Missions on the Cruise/Cargo ships, are hell on earth. Two phases, and you’re looking at 30 turns per section, as you bug hunt every room. Here is a video of the only way to deal with Lobstermen Ship Missions. Artifact Missions are surprisingly fun, they can be rushed, or bug hunted, so they will fit whatever your tactical preference is. Same with the Colony Assaults. Melee weapons were added by fan request, but for me, I just didn’t care for them and therefore didn’t use them. 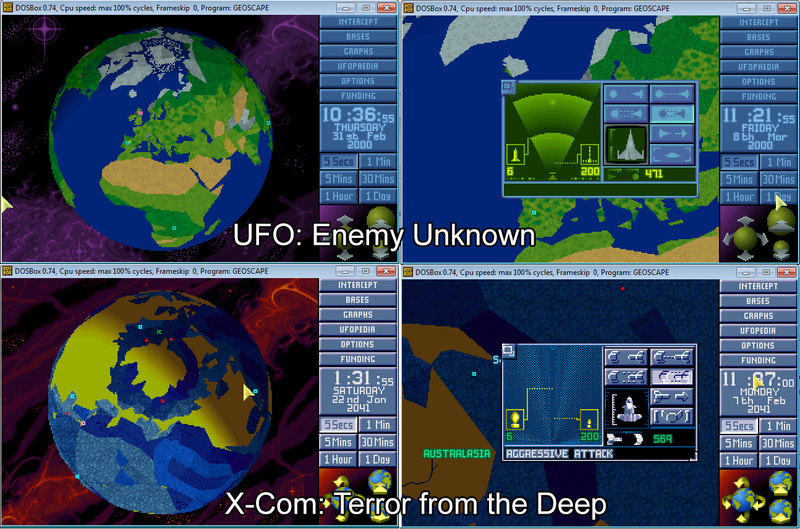 TftD is split into two modes, the GeoScape, and the Tactical (BattleScape) mode. 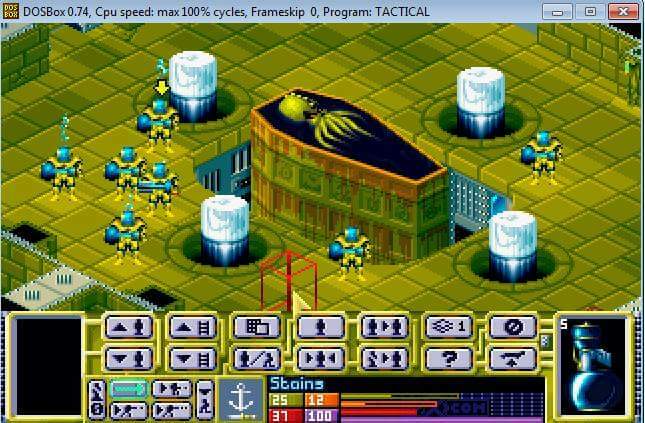 Tactical Mode is the main mode and uses isometric graphics, and turn based movement. Here you’ll issue your orders, and wait patiently while the enemy rapes your face. As little has changed between the two games, some of the negatives remain. The pathfinding is still suspect and still causes me an amount of rage. Researching T’Leth, the Alien City is just as much of a pain as Cydonia or Bust, as the research tree is not very clear. 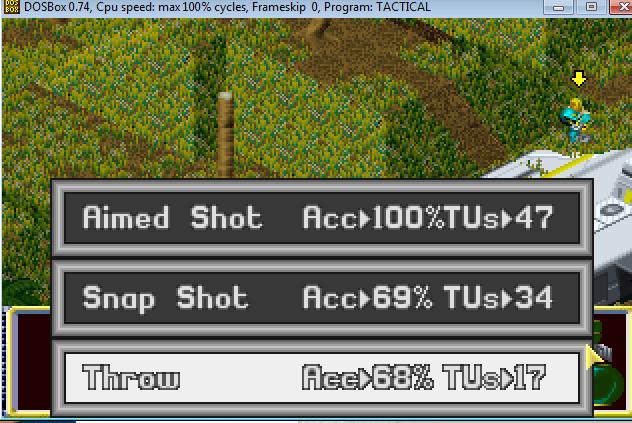 The 80 item limit remains for base defences, and just like in the first X-COM, I nearly screwed myself with a bad save. Again, there is no way to keep track of your soldiers. So when somebody dies you need to try and figure out who it was. I ended up with an excel spreadsheet listing my people. Only way to keep track! I bemoaned how easy X-COM got towards the end as you snowballed your way through the endgame. In TftD they fix this with the way missions are introduced to you, and it means the game feels much fresher for longer. The differing missions offer nice variety too. While there is significant slow down on Ship Missions and Base Defense, the change in pace works and means you are not bored by “Generic Sub Mission 87”. In X-COM, every mission was kill everything. In TftD I loved the Artifact and Colony Assaults, because you could use different tactics. It meant I could either slowly inch around, recover as much tech as I wanted/needed, or I could just hit and run with fast people, and have it over in 10 minutes. It meant I was more inclined to do extra missions, rather than just occupying myself with Sub Missions like I did in X-COM. Your men now level up much quicker (or seem too), it was only taking 6 or so missions before soldiers they were hitting 100% accuracy. The only other thing I noticed was armour now does something. In X-COM even with the top armour most enemies would one shot you, on TftD the Ion armour is actually useful, and saved my men on many occasions. Each game is different, the randomly generated missions mean no two games are the same, and the sheer RNGesus of it all means you could play the same mission 100 times and they would all end differently. The addition of the two types of land terror mission, two types of ship terror, the artifact missions, and the alien colony assaults offer a much greater variety in tactics, and locations, so while they can daunting in length, they are much more fun. Yes, Lobsterman Ship Terror Missions are a chore, but when you can piss through two stages of a Colony Assault in 10 minutes, it more than makes up for it. So overall, I would say TftD is slightly better than X-Com: UFO Defense, and while the changes appear to be mostly cosmetic they do make a fundamental difference to the game that gives a little more replayability than the first X-COM. Putting this on my list!! This is freeware still, right?! Also, I always forget to arm the vehicle with the correct underwater ammunition! I originally played this on the PS1 that was an absolute nightmare to control, and the game stuttered too much once there was more than 10 units on the level. I like Enemy Unknown, but Terror was streets ahead. I also get the ammo wrong. Once did a terror mission on a boat with only harpoons. Unsurprisingly I failed. OMG, I can’t imagine your pain level playing this on PS1. It controls OK’ish even on DOS version. Enemy Unknown, well it seems I found at least one more who agree. Because if I ever to defend that Terror is better, feels like stones gonna fly high.